The Cat D8T crawler dozer moves 18 percent more dirt per hour than its predecessor, relying on a new 4-speed automatic powershift transmission coupled with a 354-horsepower, Tier 4-F C15 ACERT engine, up from 312 horsepower. The standard semi-universal (SU) blade is 19 percent larger and can carry 13.4 cubic yards of material, up from 11.3 cubic yards previously. Optional patented Performance Cutting Edges increase payload by up to 25 percent, the company says. Operating weight increases to 87,600 pounds, and drawbar power increases by up to 13 percent. 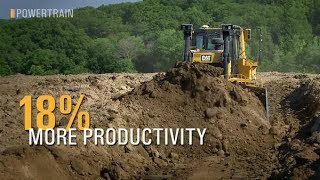 The Caterpillar-designed powertrain continuously optimizes the dozer for maximum power and greatest efficiency based on the load. The operator need not upshift or downshift, which means operators of varying experience levels can efficiently operate the dozer, the company says. An additional gear has been added between 1 and 2, and pairs with seamless lock-up clutch engagement for smooth shifting, the company says. A 10 percent increase in steering torque, fully automatic transmission, and differential steering combine to provide best-in-class steering performance under load. The ripper function has been upgraded with AutoRip 2.0 depth limit, which keeps the ripper carriage parallel to the ground for a consistent ripping depth. The dozer has grouped service points and a ground-level service center. New cartridge fuel filters, longer engine oil service interval, and standard programmable automatic reversing fan help save maintenance time. An optional Heavy Duty Extended Life Undercarriage with DuraLink provides up to 25 percent more wear life in abrasive conditions, the company says, and helps reduce maintenance time and overall cost. More robust structures provide the added durability to handle the increased weight and productivity. Factory integrated grade-control technology is available, including AccuGrade, Cat Grade with Slope Assist or 3D, and machine control. Cat Slope Indicate is standard. The dozer is remote-control ready. Operating weight standard 87,600 lb.